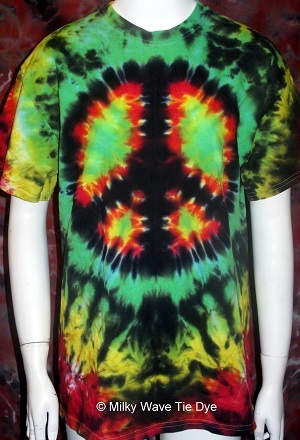 Our tie dye Peace sign in the Rasta colors is a great shirt with a great message. We give full credit to Helen, our Founder, for sticking with it in over 60 tries to get this design perfect. Check our Design Gallery for different color variations of the Peace tie dye, such as purple and rainbow.